These bearings have an optimal operation in extreme environments like cleanrooms, vacuum, high temperature, corrosive environments, and contaminating conditions. They are already being used in an extensive range of applications and state of the art technologies. Ceramic bearings consist of components (rolling elements and rings) made from ceramic and can be used in applications where conventional bearings are not suited. They have special characteristics which steel bearings do not have such as being non-magnetic or insulating. Ceramic bearings are highly heat resistant, have a longer service life, and can be divided into Full Ceramic Bearings and Hybrid Ceramic Bearings. The components of our Full Ceramic Bearings are all made of ceramic. 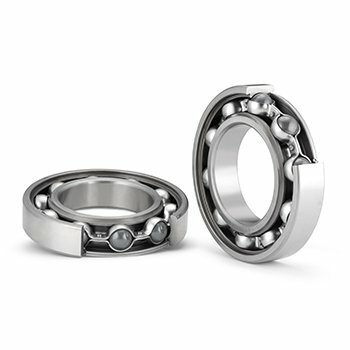 The Hybrid Ceramic Bearings have only the rolling elements made from ceramic. The outer and inner ring of the Hybrid Ceramic Bearing is made from special steel, including high carbon chromium bearing steel or stainless steel. Furthermore the cage can be made of metallic material, resin or composite material depending on the intended operating conditions of the bearing. Bearings made of stainless steel without rust preventive oil are perfectly suitable for operation in clean environments. This bearing can be used in combination with an amount of low particle emission type of lubricant based on the operating conditions such as temperature, load, and rotational speed. At JTEKT these special Koyo branded bearings are being lubricated with a Clean Pro coating or fluorinated grease. Fluorinated grease is superior to solid lubricants in load carrying capability and high speed operation. This grease can be used in applications where a scattering of slight amount of fluorinated oil is acceptable. For a vacuum environment JTEKT developed Koyo bearings from which the outer/inner rings and balls are made of martensitic stainless steel. For bearings which require corrosion resistance, precipitation hardening steel is used. When high temperature resistance is required high speed tool steel can be used. Vacuum environments where cleanliness is critical, bearings have to be clean, and polymeric lubricating material or fluorinated grease should be used..
Bearings which need to operate efficiently in corrosive circumstances are made of special materials. The selection of a Koyo Ceramic bearing for the use in a highly corrosive environment should be examined very carefully. Corrosion Resistant Hybrid Ceramic Bearings: are suitable for applications which run in water, alkaline environments, or reactive gas. Ceramic Bearings: are suitable for applications which have to run in a slightly acidic or alkaline environments or in reactive gas environments. Corrosion Resistant Ceramic Bearings: are suitable for applications which have to run in a very strong acidic and alkaline environment or in reactive gas environments. High Corrosion Resistant Ceramic Bearings: are suitable for applications which have to run in a very strong acidic or alkaline environment or in corrosive gas environments.